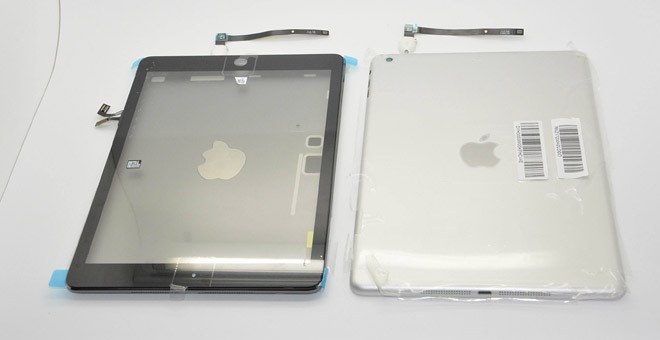 The iPad 5 and iPad mini 2 leaks are intensifying now that the iPhones are out from under their secretive wraps. The new iPads will reportedly follow the iPhone 5s’s lead and come in space grey, silver and gold. A couple of new leaked photos show us a peek at the space gray iPad mini 2, while good looking renders imagine what both new tablet will look like in all three color options. The photos come from Sonny Dickson who specializes in Apple leaks and is on occasion right months before the device is official, but also very wrong at times. The silver version looks the same as the current iPads – naked aluminum – but the space grey version looks anodized to make it darker. There’s also a photo of the iPad mini 2 in gold, but that one feels a bit like a render. Speaking of which, here are the renders by Martin Hajek, who based the models on the leaks so far and have a good chance of looking pretty close to the final design (Apple’s recent design changes have been fairly minimal). Dickson has also posted info on the new iPads specs – like an A7 chipset for the iPad mini 2 and Touch ID sensor for both. The iPad 5 will reportedly sport an A7 too, but with 2GB of RAM instead of just 1GB like the mini 2.